Getting Your Mind Ready to Race! Whether it’s your first race or your 35th, you may already know that running or walking a marathon or ½ marathon is just as much mental as it is physical. With that in mind we are pleased to be offering for this year’s race a “Psyching Team” to help you as you prepare to run the race. We have partnered with Dr. Stephen Hamilton and a number of volunteer sports psychologists and sport performance consultants to offer mental strategies before, during, and after the USAF Marathon & ½ Marathon. Known as the Psyching Team, the goal is to provide commonly-used performance strategies including appropriate goal setting, mental rehearsal, arousal control, relaxation strategies, and positive self-talk to put your mind at ease. Psyching Team members are trained in these methods and can tailor a technique to the particular person to help address such things as pre-race jitters, anxiety about a nagging injury, feeling too amped up, or self-pressure about achieving your goals. The services provided are fun, helpful and best of all – FREE! What more could you ask for. Psyching teams have been used with great success and benefit for marathon participants at a number of races around the country and Canada including the Toronto marathon, Columbus OH marathon and New York City marathon just to name a few. 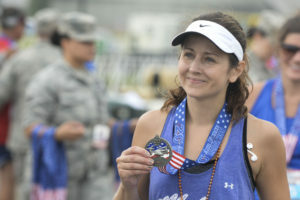 Runners and walkers have expressed specific interest in learning about relaxation and setting realistic goals as well as how to be the most mentally prepared for race day. As part of this year’s inaugural USAF Psyching team, we will be hosting a booth at the Expo, as well as be at the starting line, during the race and after the race. At the Expo: Team members are available Thursday and Friday for consultation and mental strategizing. You will find them at the Psyching Team booth. Look for the Psyching Team shirts! At the Starting Line: For those last minute mental strategies (and a friendly face), Team members will be around the START. Again look for the Psyching Team t-shirts. During the Race: Psyching Team members will be positioned at various spots along the race route and will provide support to athletes by running or walking with them or calling out from the side of the route. This is particularly helpful in those final miles! After the Race: How did the race go? Team members will be available after the race to help you mentally mark your accomplishment just after you’ve finished or, if necessary, help you cope with less-than-happy feelings. 1. Have a race plan and stick to it. 2. Set realistic goals that give you some flexibility, such as finishing in 5-5 ½ hours. 5. Start easy and gradually pick up your pace. 6. Check your form regularly. 7. Use deep breathing and take periodic stretch breaks to relieve tension. 8. Distract yourself when tired or aching. 9. Use self-talk to remain positive and keep negative thoughts at bay. 10. If doubts arise, recall your reasons for running. 11. When finished, stretch lightly, keep moving and elevate your legs when sitting. 12. Enjoy yourself and have a great run!